Have you ever wondered how a CD is made? Compact Disc’s have become an intrinsic part of modern life. They’re everywhere: They carry our music, our work files, school projects, they come through our letterbox with adverts and hold the software for our computer programs. In short, while twenty years ago they were a luxury, now we would be lost without them. But haven’t you ever wondered how CD manufacturing works? How are these discs put together and what are the resources that go into them? The answer is not as complex as you might imagine: There are five main layers to a CD. However, because in the process of CD manufacturing, each layer must be produced separately so the manufacturing process has many stages and is quite detailed. The first layer on a CD is thick and manufactured from Polyvinyl Chloride (PVC), a soft, clear polycarbonate plastic. Interestingly, this layer makes up 99% of the CD the other four layers making up only 1% of it! Thus, this layer is very important, serving two purposes: First, it protects the data layer from scratches and secondly, like the lenses in spectacles, it helps the laser beam to focus on the data itself. This layer of the CD is manufactured by feeding small granules of PVC into a hydraulic press where they are heated until they melt. The molten plastic is then forced by a screw into a mould cavity and it takes on the round, CD shape. The plastic is then allowed to cool and harden and a robotic metal arm removes it and stamps the hole into the middle. This is called the ‘stacking ring’. Next comes the ‘data layer’, perhaps the most complicated part of CD manufacturing. The data on a CD consists of many pits and lands, bumps which go up and down and represent either a one or a zero. They work in a way very similarly to binary on a computer or simple on and off switches in a light. These pits and lands spiral out from the centre of the CD and are read and interpreted by a laser. Unlike the vinyl, however, the data is read from the inside to the outside on a CD and not the other way around. To place these very important pits and lands on the CD during the manufacturing process, a glass master copy of the data is made in the image of how the CD will look, using a powerful laser and something akin to a CD writer. The glass master is then pressed against a metal disc to create a negative image of the CD, making a mould, or ‘press’. (Hence the term ‘to press a CD’, or ‘CD pressing‘.) Once the press has been made, the clear PVC disc is pushed against it, so that the data is imprinted on the surface of the disk itself. This part of the process of CD manufacturing is a little different if the CD is a recordable one. In this instance instead of a data layer, a photosensitive dye is applied. This dye, when exposed to certain light which can be emitted from the lasers in CD writers, creates the impression of a pit. Similarly, a re-recordable disk uses a dye, but a slightly different one which allows the laser to polarize the layer back and forth between a pit and a land. The next stage in CD manufacturing is to place a thin layer of metal onto the PVC disc. The metal is usually silver or aluminium but it can also be made from gold or other metals. It is applied to the PVC disc on top of the data using a process called sputtering, which means that a surface, here the disk, is bombarded with small atoms of a substance, in this case the metal. This makes the CD act as a mirror, reflecting the CD player’s laser back to the reader. It’s also this that gives the underside of a CD its shiny appearance. The CD manufacturing process is nearly done now and the last major physical change to the disc takes place: A thin coating of lacquer applied in a ring around the centre of the CD and spread out to the edges by spinning the disk very fast. The edges are also coated with lacquer. This coating ensures the safety of the data and the foil, which are the most important parts of the CD to protect. All the other parts of the CD manufacturing process are almost purely cosmetic, including the final layer, the application of the label which contains information about what is on the disk, who made it and possibly a few graphics, especially if it is a music CD or a film. The disk is now ready to be printed and packed and it is only after this that we, the consumers, see the disk! 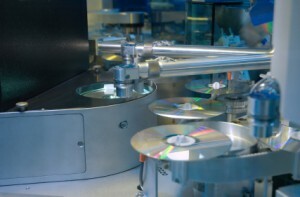 It is very rare that we actually appreciate the time and energy that goes into manufacturing a CD. But now, next time you use one (which these days will probably be very soon) you can look at it and know exactly how it was made! Posted in History | Comments Off on Have you ever wondered how a CD is made? Which CD Type Should You be Using? Since the development of the simple Compact Disc, so many other formats have become available it can be very confusing to know which ones are the best to use! Hopefully, this little guide will go some way in helping you make your mind up which one is most suited to your needs! When considering which CD to choose, there are several factors to take into account, for instance the lifespan of the disc, which CD readers can use it, whether it will work with your recorder, the memory size and whether or not it is best suited to the job you need it to do. The main types of CD in use are: CD, CD-R, CD-RW, DVD, DVD-R, DVD-RW and DVD-RAM. It is worth bearing in mind that each disc will have certain unviewable information already written onto it which will tell computers and CD players what kind of disc it is. Unfortunately, this unseen data cannot be changed. A General Note on CDs: Due to their limited memory, it is advised not to use CDs for games or video, as these take up a great amount of room and are very complex files to store on such a small device. You would be better off using DVDs in this instance. Cost: More expensive than the home CD duplication, but you pay for a professional looking product. If you want more than 500 copies of a disc it is cheaper than CD-R/-RW. Cost varies significantly depending on the company being used. I recommend Duplication Centre UK. Players which can record onto it: Only professional machines can do this kind of CD duplication. 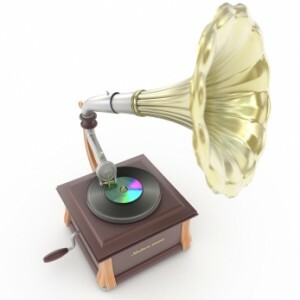 Functions: Professionally pressed CD’s which contain music files to be played on computers or CD Audio Players. Best used for band disks, promotional music, audio-information (for instance recorded speeches or radio play samples). Due to having a long life span they are very good for professional release as well. Because they are made using a Glass Master and pressing machines, you will need a replication company such as Replication Centre UK to produce them for you! Quality Notes: Quality is guaranteed if a professional company is used. These are very difficult to create without the correct machinery for CD duplication. Lifespan: 50-100 years if stored in a cool, dark place. Recording Speed: Fast. The fastest out of all of the discs suitable for home CD Duplication, they can be burned in under two minutes each. Cost: Approximately 15-20p per disc without cases or artwork. Cheaper than CD-ROMs if you want under 500 copies. You can get professional companies to produce them for you, and I recommend Duplication Centre UK. Players which can read it: Most. Some in-car players will not play them and also some of the older CD Audio Players. Players which can burn it: All players with CD-R or CD-RW duplicators can record them. Functions: These discs are generally used to store music, not because they can’t store other data – they can: Photos, small video clips, word documents, etc. – but because information is permanently placed on them, they tend not to be used for backing up files or anything else which needs only short-term storage. While the quality of sound is not nearly as good as the more professional CD, CD-Rs are cheaper with the same amount of memory. However, their life expectancy is not as long and they are more susceptible to damage from heat and sunshine exposure. However they are faster to produce than CD-ROMs, which need a Glass Master copy of the CD which takes time to produce. Quality Notes: Quality varies greatly depending on the company who produced the blank CD-Rs in the first instance. It is generally recommended to go with a recognised brand who will be forced by law to stick to the standard guidelines for quality. Other Notes: Other variations on this kind of disk include the Music CD-R which is specifically designed for storing music files and reaches a professional standard of sound (however these are much more expensive at 50p a disk) and the Graphics CD-R which play graphics and music simultaneously. These last are almost exclusively used in karaoke bars and are also more pricey. Recording Speed: Medium. They are not as fast as CD-Rs but not as slow as DVDs at between 3-4 minutes per disk. Cost: Approximately 20p per disk. Players which can read it: Mainly only computers and some CD Audio Players. However compatibility with Audio Players does go up if the CD is recorded all at once rather than in lots of segments. Players which can burn it: Only drives with the CD-RW recording capacity. Re-Record? Yes. Up to 1000 times. Functions: These disks, though slightly more expensive than the CD-R, can be re-recorded onto which is a great plus. They are generally used for storage of data files such as photos, short films, word, excel or powerpoint documents, music which is still being edited, etc. They are also generally used for backing up files as, when the back up needs to happen again, you can record the information over the top of the old back up on the same disc! They can also perform the same uses as CD-Rs but are often not used for these because of the price difference and CD-RW’s incompatibility with most Audio Players. Quality Notes: Quality varies greatly depending on the company who produced the blank CD-RWs in the first instance. It is generally recommended to go with a recognised brand who will be forced by law to stick to the standard guidelines for quality. Other Notes: Environmentally, they are more sound than the CD-R because there is less waste – any old disks can simply be re-recorded whereas with CD-R they must be thrown out! A general note on DVDs: It is advised, due to their cost, that DVD’s be used almost exclusively for films or games. 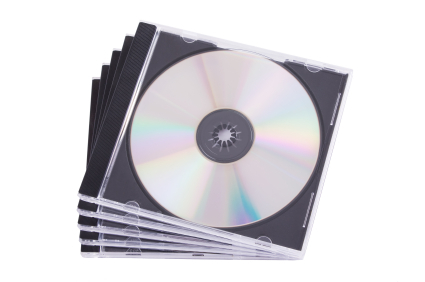 Unless you wish to transport very large files, it is much more economical to use CDs. Cost: More expensive than home DVD Duplication but, again, you pay for a professional finish and quality. Also the price will vary depending on which company you use. I would recommend Replication Centre UK. Players which can burn it: They are nearly always professionally produced due to the machinery required to create them. Functions: DVDs are primarily used for storing film or gaming data. It is not advised to use them for storing non-professional data as home DVD-RW duplication is much more economical in this case. However, they can be used for advertising films, full length films and games of every sort (for computer, xbox, PS3, etc.). They are also used for any film/game which needs to be distributed amongst a large audience as they do not have the drawbacks or DVD+/-R with wheather or not equipment can read them. Many things which are put onto DVD-ROMs are ordered in bulk, as it saves time to get someone else to do the job for you! Quality Notes: Because it is professionally done, the quality is guaranteed. Recording Speed: Slow. Definitely slower than any CD: At between 3-10 minutes depending on the speed of you drive, DVD-/+R duplication is time consuming. Cost: A little more than a CD at between 25-30p per disk. Players which can read it: This is a little complicated: DVD-R and DVD+R while being essentially the same thing can only be read by equipment which supports them respectively: DVD-R can only be used with equipment which supports DVD-R disks and DVD+R with equipment that supports DVD+R disks. Nearly all players nowadays are DVD-R compatible. Players which can burn it: DVD-R can only be used with equipment which supports DVD-R disks and DVD+R with equipment that supports DVD+R disks. Re-Record? Not for DVD-R but DVD+R things can be added later as it is still accessible. This does NOT make it re-writable as data cannot be deleted from it. Functions: These are generally used for home-videos, prototype game designs,adverts, films still in the editing stage – basically files which are enormous, complex and doesn’t need to look entirely professional. Also, these disks don’t tend to be used for things which must be produced in bulk as it would be a time consuming DVD duplication process. Quality Notes: Quality varies greatly depending on the company who produced the blank DVDs in the first instance. It is generally recommended to go with a recognised brand who will be forced by law to stick to the standard guidelines for quality. Lifespan: Up to 30 years. Less all other discs except DVD-RAM. Memory: 4.7 Gb. Typically can hold up to 2 hours of video on standard SP (short play) setting. Recording Speed: Slow. Definitely slower than any CD at between 3-10 minutes depending on the speed of you drive, DVD-RAM duplication is time consuming. Players which can read it: The same rules apply as with DVD+/-R: DVD-RW can only be used with equipment which supports DVD-RW disks and DVD+RW with equipment that supports DVD+RW disks. Players which can burn it: DVD-RW can only be used with equipment which supports DVD-RW disks and DVD+RW with equipment that supports DVD+RW disks. Functions: These are generally used for films or games which are still in the editing process or other large files which need editing, saving or backing up. They can be used to back up much larger systems than CD’s. Not used so much for long-term storage due to their shorter life span. Quality Notes: Quality varies greatly depending on the company who produced the blank DVD+/-RWs in the first instance. It is generally recommended to go with a recognised brand who will be forced by law to stick to the standard guidelines for quality. Other Notes: Environmentally, they are more sound than the DVD-R because there is less waste – any old disks can simply be re-recorded whereas with DVD+/-RW they must be thrown out! Players which can read it: Most DVD Players and DVD drives in computers. Players which can burn it: All DVD recording devices will be able to burn DVD-RAM disks as they are the oldest and easiest of the disks to use. Re-Record? Yes – up to a whopping 100,000 times! Functions: These are generally used for films or games which are still in the editing process or other large files which need editing, saving or backing up. They can be used to back up much larger systems than CD’s. Not used so much for long-term storage due to their shorter life span. Due to the massive amount of times they can be re-written they are almost certainly useable for re-writing for their entire life-span! Quality Notes: Quality varies greatly depending on the company who produced the blank DVD-RAMs in the first instance. It is generally recommended to go with a recognised brand who will be forced by law to stick to the standard guidelines for quality. I hope this helps you make your mind up on which type of CD best suits your needs! Posted in Helping You Decide | Comments Off on Which CD Type Should You be Using? Is easy to create an Autorun CD for yourself! An autorun CD is a CD which will play automatically when you insert it into a computer. They are also surprisingly easy to create: All you need to do is to add to your CD an autorun file, a straightforward text file made in notepad, which instructs your computer to start an executable file. An Autorun CD can be used for many reasons, not least of which for business and advertising purposes: It looks very professional if when your customer loads a CD into their computer it automatically starts running. Also, it makes the customers life easier, and ensures that even those people who aren’t very technologically capable can use your CD. You could even use it to send holiday photos or a home video to a friend or relative who can’t really use a computer! Depending on what kind of file you are trying to run, you will need to use a different kind of autorun command. There are two main types: The first uses the ‘open’ command and will run any file ending in ‘.exe’ – that’s software – and the second is the ‘shellexecute’ command which will open nearly any file in it’s designated application – this is needed for powerpoint presentations, videos and other files that require software to open them. For photos, you may want to create a slideshow program, instructions for which will follow in a later article. NB – The ‘shellexecute’ command was only introduced with Windows 2000 so you will need either that model or a later one to make it work. Also, for both ‘shellexecute’ and ‘open’ commands there should be no spaces in any of the text in an autorun file. Instead, replace spaces in filenames with underscores, otherwise the autorun will not work. And if a file you want to run is inside a folder, then instead of writing simply ‘filename.filetype’ you should write ‘foldername/filename.filetype’. Some users may have intentionally switched off the autorun option on their machines but this only counts for a small percentage of consumers. If you have mastered that and want to experiment with something a little fancy, you could try adding a ‘label’ and/or ‘icon’ command to your CD. These two commands give your disc a personal icon and label in Explorer, which you can make anything you want, so long as you provide the image for the icon too. Simply save your autorun file as ‘autorun.inf’ in the root folder of you CD, the top-most folder in which everything else is stored. Note that it will not work if it is inside any other folder! Have fun creating your Aurtorun CD’s! In 1978, two of the greatest technological giants, Sony and Philips, were poised on the edge of a technological development war, both locked in a race to be the first to develop the CD (Compact Disc). But to understand how this race began, we must look some years back in CD history, to 1957, when the digital video experiments of the Italian Antonio Rubbiani inspired a new generation of scientists to think about digital technology and the possibilities behind it. CD history was in its infancy, but it had begun. Twelve years later, in 1969, the experiments began in earnest and in 1970 Philips began to work on ALP (Audio Long Play), a new concept using digital audio as opposed to analogue to make longer playing discs in less space than a vinyl took up. For a long time, however, the research was slow, and in 1978 Philips failed on its experiments with video disc technology. Thus, to make up for this loss, it launched the new Compact Disc Project. The idea behind the Compact Disc was that it would replace the previous vinyl analogue equipment which had dominated the market, and also replace the Compact Cassette Tape which had successfully been running alongside the vinyl for some years. The name Compact Disc had been decided upon the year before (when Philips had begun to take more note of its digital audio research department), based on the idea that it would remind people of the Compact Cassette and it’s own success. However Philips, though far ahead on the physical design of the CD to the point at which they had already developed commercial Laserdisc Players, simply did not have the electronic digital audio recording experience necessary to develop the technology any further. At this time, Sony was also working on the development of the Compact Disc, but was having the opposite problem in that it had just over a decade of digital recording experience under its belt but not the physical understanding to make the CD possible. So, at a meeting in Japan in 1979, Philips and Sony shocked the world and made a striking development in CD history by coming together to develop the Compact Disc in a joint effort. The ceasefire was called on the developmental war and for a couple of years, the two companies worked together. Philips was the primary designer of the disc itself; the pits and lands on the disc’s surface which are read by a laser, with no physical contact required. On the other hand, Sony was responsible for the digital to analogue circuitry, especially the digital encoding an the error-correction code design. In 1980, the pair brought out what is now referred to as the ‘Red Book’ format (because of the first publishment’s cover being red), which gave the standards for CDs, including specifications about recording, sampling and the size of the disc itself, which is still the same today. At 120mm in diameter, the Compact Disc was a more portable, convenient size than the larger vinyl and could also hold more data than either vinyl or cassette tape. The size, so legend has it, was decided on because Sony insisted that the Compact Disc must be able to hold all of Beethoven’s Ninth Symphony without interruption. However, once the CD had been developed, Sony and Philips began their race again, both rushing to be the first company to release a commercial CD audio-drive. In the end, Sony beat Philips by just one month. So it was that on October 1st, 1982, Sony brought out the CDP-101 Compact Disc Player, a landmark event in CD history. It was released first in Japan, then Europe but, surprisingly, did not make it to the USA until early 1983. This new CD player was soon followed up in 1984 by Sony making the first portable CD player, again beating Philips to making CD history. The first CD to be pressed was The Visitors by ABBA and the first album to be produced was Billy Joel’s 52nd Street Album. In fact, despite many music label’s initial concerns, CD’s took off very well, with over one thousand different single’s and albums being brought out in the first year alone. Although Sony and Philips had raced again in terms of technology, the still collaborated on standard for some years to come and in 1983 released the ‘Yellow Book’ standard (that’s right, this cover was yellow!) 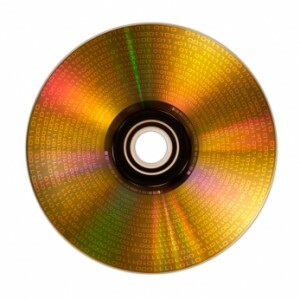 which revealed the idea of the CD-R (Compact Disc-Recordable) which allowed, by modifying the de-coding electronics of the CD, for one to be able to store data on a disc which could be read by a computer. This was very exciting development in CD history and the implications for technology were astounding: CD-‘s were more reliable than the previous floppy-disc technology and they could also store a lot more data for their size. They were also faster. However they weren’t developed to the standard of general public use until 1990. After this, the next massive leapt forward came in 1995, when Sony pioneered a nine company investigation in standardising DVDs, a development which had been in the pipeline for a while. DVDs (Digital Versatile Discs) were aimed not only at replacing the analogue form of video storage, video cassettes, but could also be used in place of CD-ROMs and CD-Rs to store data for computers. Though to this day they are not wholly standardised (we still have both DVD-R and DVD+R on the market) the conglomerate Sony put together did ensure the accessibility of DVDs to all sectors of the public. CDs have remained popular now for many years, being used as they were initially intended, replacing vinyls and cassette tapes, but also for many more things, for instance the storage of computer data. The technological leaps which have come out of Compact Disc history are astounding, including the advent of DVD’s and digital video recording. A simple disc had had such an impact on our technology, and it looks as if it isn’t done yet: Blu-Ray discs have recently been brought onto the market, increasing the high definition standards of our films, and goodness knows what else in in the pipeline as an offshoot of the Compact Disc! You are currently browsing the Duplication Centre Resource Centre blog archives for November, 2009. Duplication Centre Resource Centre is proudly powered by WordPress | Entries (RSS) | Comments (RSS) | 23 queries. 0.025 seconds.